Commerce ISD hosted its third annual Special Olympics competition on April 21 at Memorial Stadium. The event allowed disabled children to compete and win awards in a variety of athletic contests. 275 student athletes gathered from 17 northeast Texas schools to participate. In addition, there were more than 50 volunteers present. Dian Underwood, the Commerce High School Special Education Director, coordinated this event, and Department Chair for Commerce ISD Terry Buckley said that the Commerce meet has doubled in size since it began three years ago. Each of the participating schools has its own Special Olympics team that travels around the state to compete in track meets like this one. 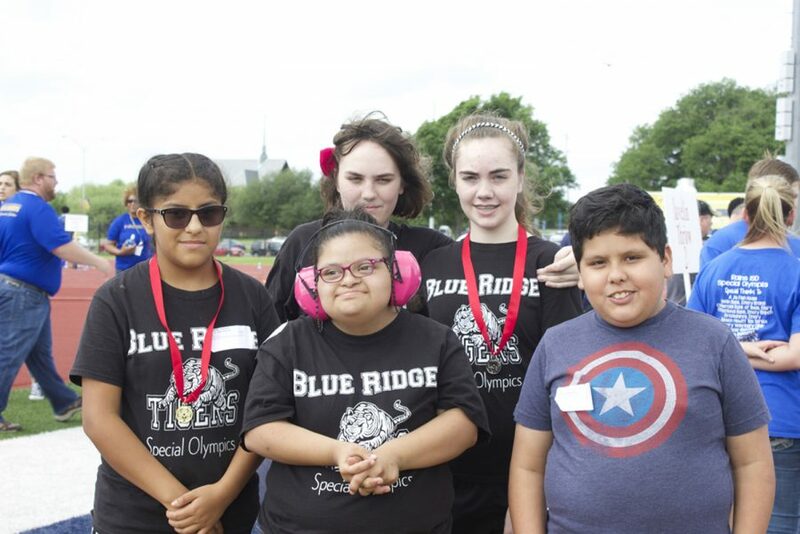 These events “have a positive impact, for sure,” because “the kids are getting to compete in a track meet, just like regular students at a regular track meet,” explained special needs teacher Carla Buck. She also said that the Commerce meet was especially well organized. Diamend McFadden, a 15-year-old from North Lamar, said that his favorite part of the day was getting to hang out with his friends from other schools. This meet also provided an opportunity for the participants to exercise. “Individuals with disabilities are five times as likely to develop disorders and diseases associated with lack of activity. . . so providing opportunities like this for, in general, younger individuals to be active, and teaching them how to be active later in life, is just crucial,” Steve Prewitt, a professor at Texas A&M University – Commerce, said. A&M – Commerce provided the venue and some of the volunteers, and Prewitt coordinated the school’s participation. “We’re really establishing a good relationship between the university and the community, to bring all of these athletes here and give them a good experience,” Prewitt said. Many of the university volunteers were student athletes, but anyone was welcome to help out. One A&M – Commerce volunteer, Ashley Phillips, has participated all 3 years. Up until seven years ago, the Commerce community hosted a similar annual event for disabled children. After the event ended, Buckley said that the kids needed someone to take up the reins and make this opportunity possible for them again, so she did just that. Every year since its beginning, the Commerce ISD Special Olympics track meet has had more attendees and publicity. All of the volunteers encouraged others to get involved with the event. “You’ll see the kids just having a blast, and for them to have people cheering them on as they’re running is just really special,” said Jacob Wilcox, a volunteer from Commerce High School. To get information on volunteering, students should contact Steve Prewitt from the A&M – Commerce Department of Health and Human Performance. I just wanted to make clarification that I am the Department Chair for the High School not the Special Education Director. Her name is Dian Underwood. Thank you for the great write up though! Thank you for that correction! We’ll correct it right away.